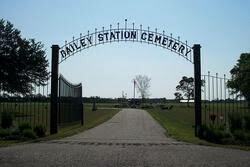 In 1992 Nick Anderson, a local Boy Scout, dedicated his Eagle Scout Project to Big Lake Township’s Bailey Station Cemetery. His project included research, restorations and preparing the cemetery to be operational again. In July 1995, a Volunteer Board of Directors was formed to re-establish the cemetery and maintain its function. At the Reconvened 1995 Annual Big Lake Township Meeting, the Citizens of the Town voted to approve a levy for the project. Memorial Day 1996 was the first day lots were once again available for public purchase. For more information contact the Cemetery Actuary: Jacque Nadeau, at 763-263-3762. County Road 14 just 1/2 mile South of Highway 10.